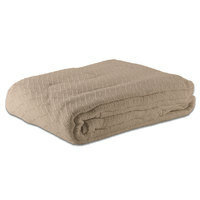 If you're looking to match a specific color scheme, we offer hotel bedding in beige, blue, white, and green. 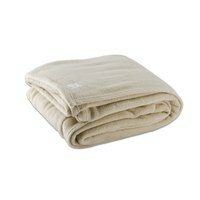 These blankets will add a home-away-from-home look and feel for guests and are sure to keep them comfortable during their stay. Some of these products feature a thermal herringbone design, while others are made of cozy fleece. 100% Cotton Hotel Blanket - Thermal Herringbone - White Twin 66" x 90"
100% Cotton Hotel Blanket - Thermal Herringbone - White Queen 90" x 90"
Fleece Hotel Blanket - 100% Polyester - Jade Green Full 80" x 90"
Fleece Hotel Blanket - 100% Polyester - Navy Blue Full 80" x 90"
Fleece Hotel Blanket - 100% Polyester - Desert Tan Twin 66" x 90"
plus100% Cotton Hotel Blanket - Thermal Herringbone - White Full 80" x 90"
Fleece Hotel Blanket - 100% Polyester - Vanilla Full 80" x 90"
100% Cotton Hotel Blanket - Thermal Herringbone - White King 110" x 90"
Fleece Hotel Blanket - 100% Polyester - Light Blue Twin 66" x 90"
Fleece Hotel Blanket - 100% Polyester - Desert Tan Full 80" x 90"
100% Cotton Hotel Blanket - Thermal Herringbone - Beige Full 80" x 90"
plus100% Cotton Hotel Blanket - Thermal Herringbone - Beige King 110" x 90"
100% Cotton Hotel Blanket - Thermal Herringbone - Beige Queen 90" x 90"
plus100% Cotton Hotel Blanket - Thermal Herringbone - Beige Twin 66" x 90"
plusFleece Hotel Blanket - 100% Polyester - Desert Tan King 108" x 90"
Fleece Hotel Blanket - 100% Polyester - Desert Tan Queen 90" x 90"
plusFleece Hotel Blanket - 100% Polyester - Jade Green King 108" x 90"
plusFleece Hotel Blanket - 100% Polyester - Jade Green Queen 90" x 90"
Fleece Hotel Blanket - 100% Polyester - Light Blue Full 80" x 90"
plusFleece Hotel Blanket - 100% Polyester - Light Blue King 108" x 90"
plusFleece Hotel Blanket - 100% Polyester - Light Blue Queen 90" x 90"
Fleece Hotel Blanket - 100% Polyester - Navy Blue King 108" x 90"
Fleece Hotel Blanket - 100% Polyester - Navy Blue Queen 90" x 90"
Fleece Hotel Blanket - 100% Polyester - Navy Blue Twin 66" x 90"
Fleece Hotel Blanket - 100% Polyester - Vanilla King 108" x 90"
Fleece Hotel Blanket - 100% Polyester - Vanilla Queen 90" x 90"
Fleece Hotel Blanket - 100% Polyester - Vanilla Twin 66" x 90"
All of these hotel blankets are machine washable, which makes cleaning rooms between guests a breeze. You’ll also find them in a wide variety of widths to suit your business’s specific needs. Whether your guests are traveling for business or pleasure, our durable yet comfortable hotel bedding is sure to keep them feeling like royalty. 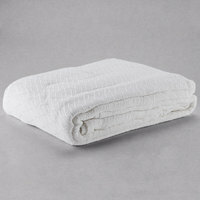 For related products, check out our hotel towels, hotel shower curtains, and hotel room amenities. If you're wondering where to buy hotel blankets, we have a large selection of hotel blankets for sale at the lowest prices.